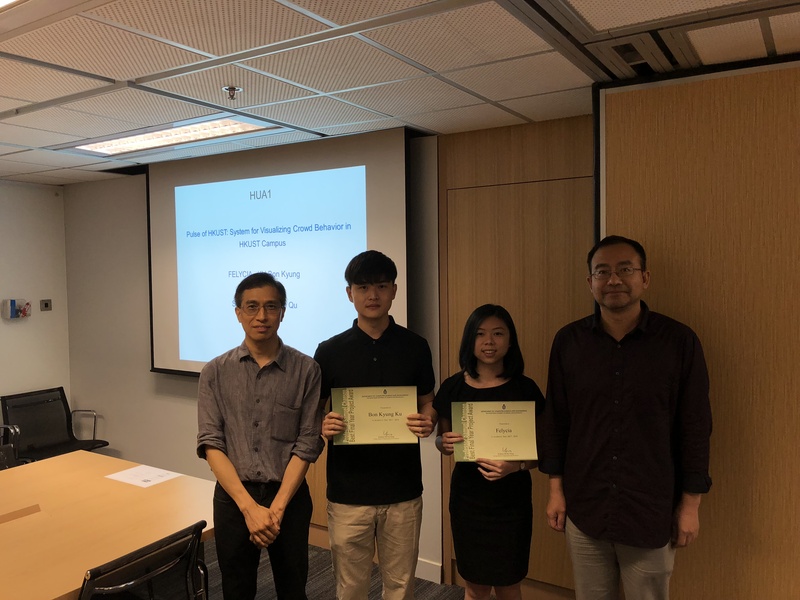 Our group has graduated 18 PhDs and 17 Mphils. 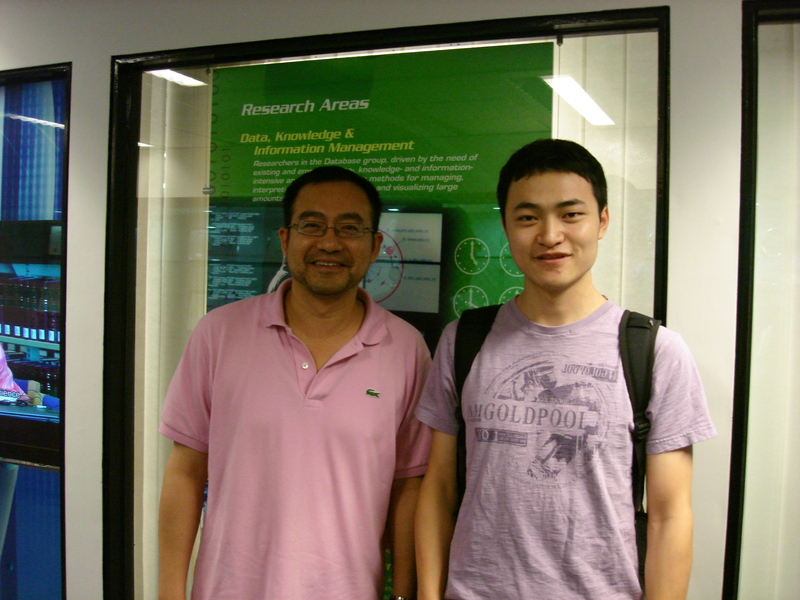 We have supervised about 60 independent study projects for MscIT/MscBDT students and about 100 UROP projects. 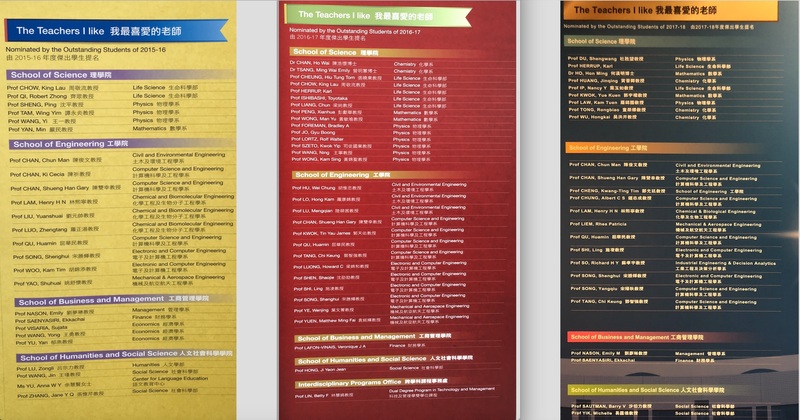 We provide a very friendly learning environment for students and have attracted many talented students in the past including 6 Hong Kong PhD Fellowship Award Winners, 9 HKUST academic achievement award winners (top 1% students), and students ranked among top 5 of their grades from Tsinghua University, Zhejiang University, Shanghai Jiaotong University, Xi'an Jiaotong University, University of Science and Technology, Nanjing University, Huazhong University of Technology, Wuhan University, South China University of Technology, Sun Yat-sen University, and Shandong University. 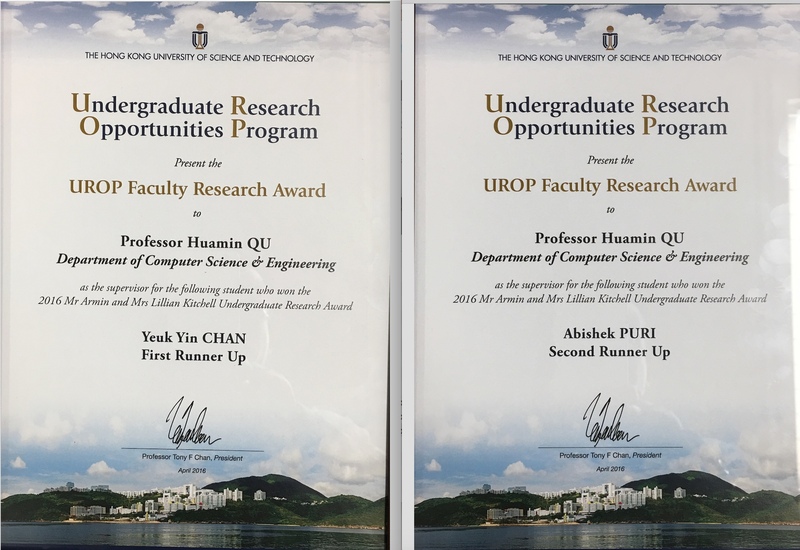 Students (from UG, Mphil, to PhD) in our group have received various prestigious awards under my supervision. 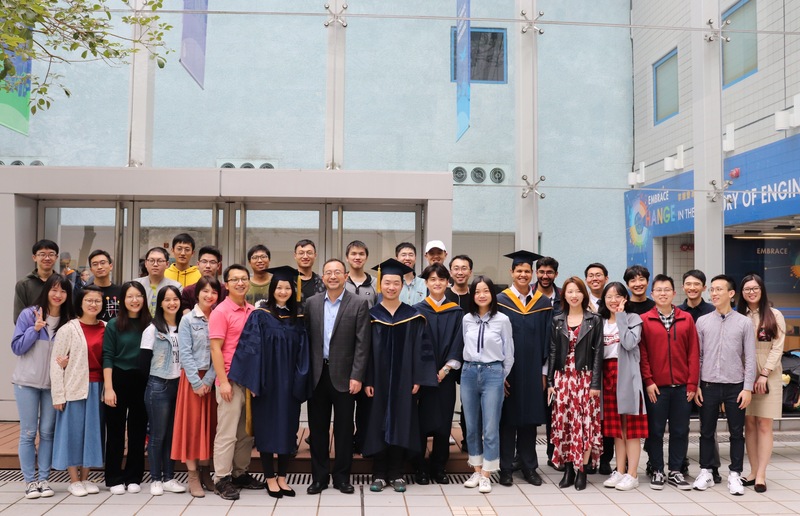 The graduate students from our group have taken positions in Microsoft Research Asia, IBM Watson, Bosch Research USA, Siemens, Hong Kong Government, Shenzhen University, Zhejiang University, University of Electronic Science and Technology of China, Google USA, Google London, JP Morgan, Oracle Shenzhen, United Bank of Switzerland, Goldman Sachs, etc. 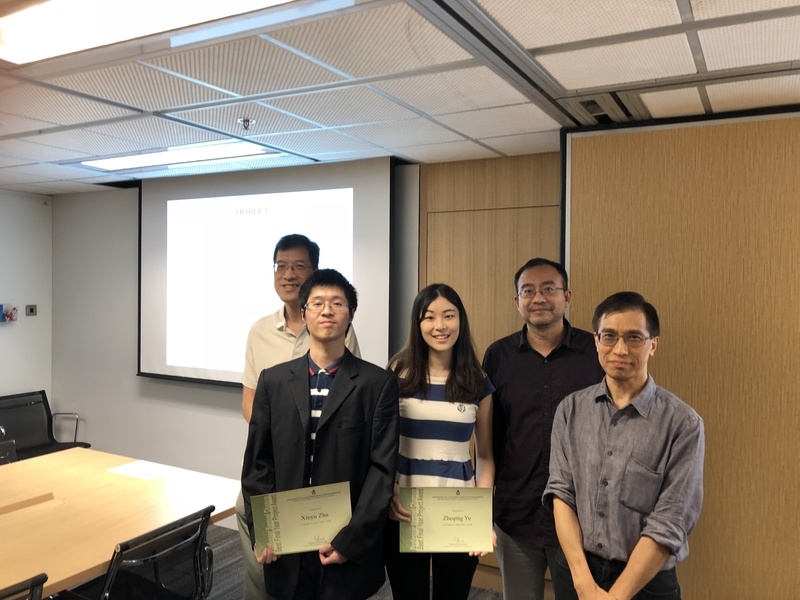 Two students have been selected by China's 1000 Talented Youth Program (国家青年千人计划）, which is one of the most prestigious talent programs for young scientists in China. 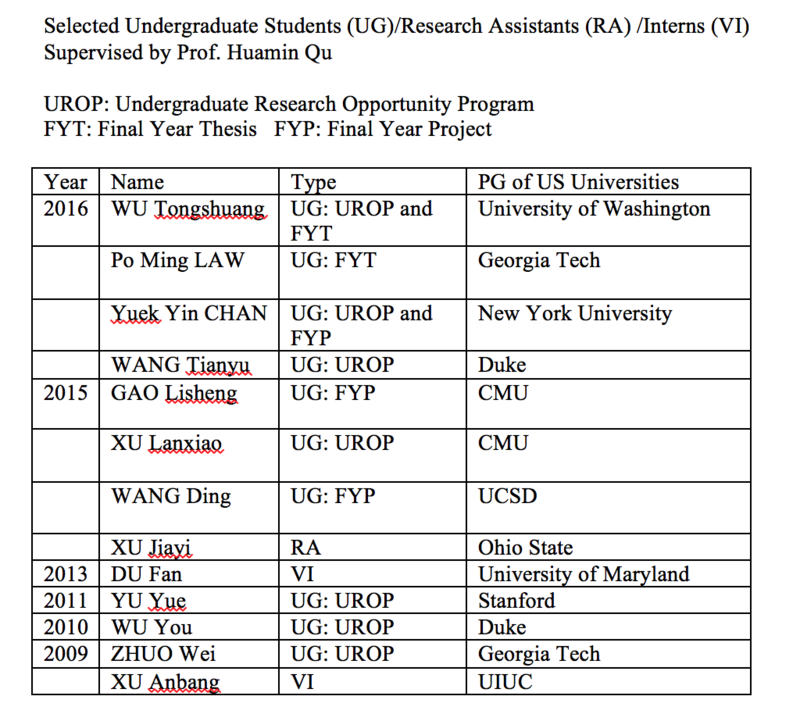 The undergraduate students pursue PG in Stanford, CMU, UIUC, Georgia Tech, University of Washington, Duke, New York University, etc. 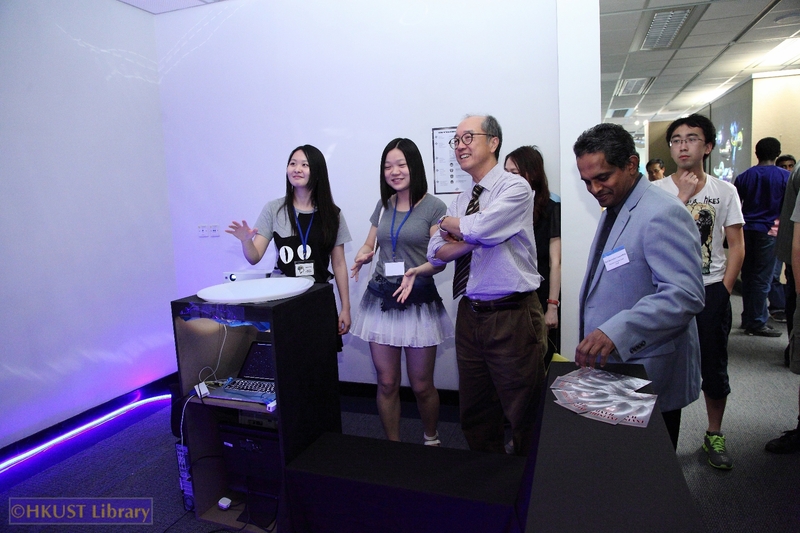 We closely work with industry and our group is very well funded. 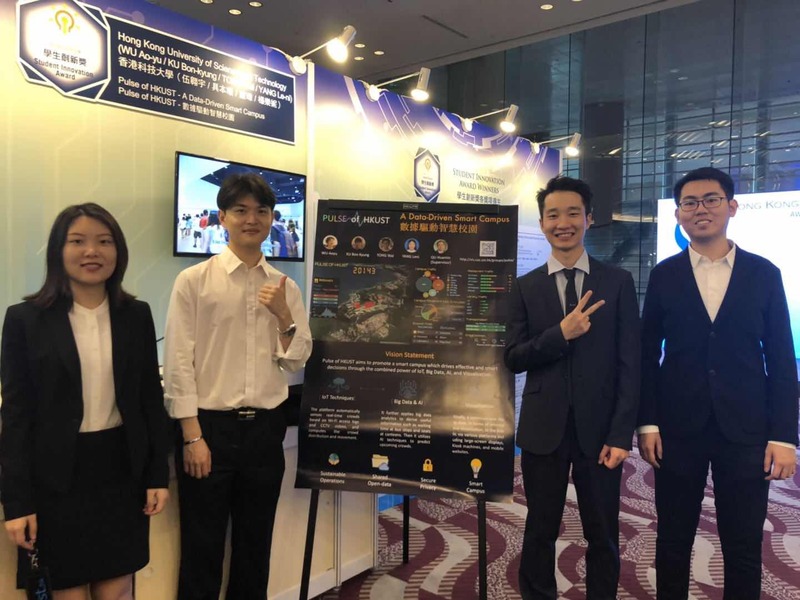 The technologies we developed have been adopted by Microsoft, IBM, Huawei and Tencent, and results have appeared in various journal covers, brochures, and webpages (see Gallery ). 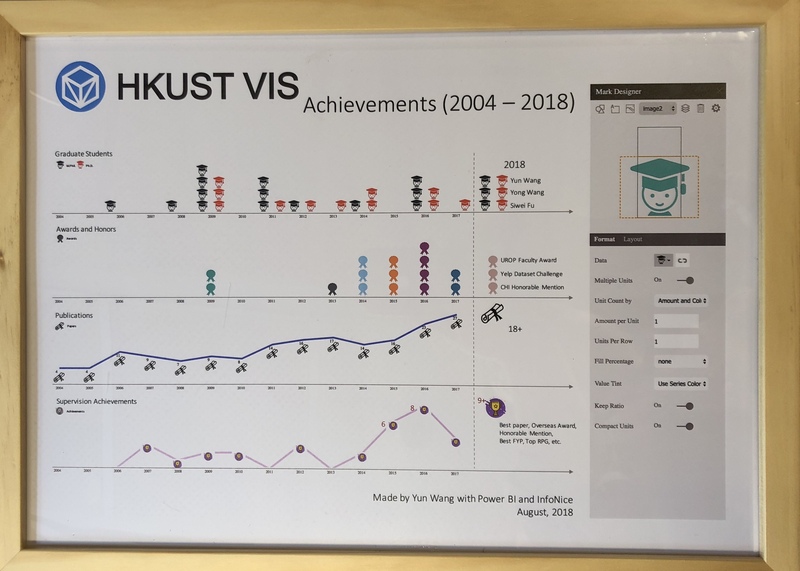 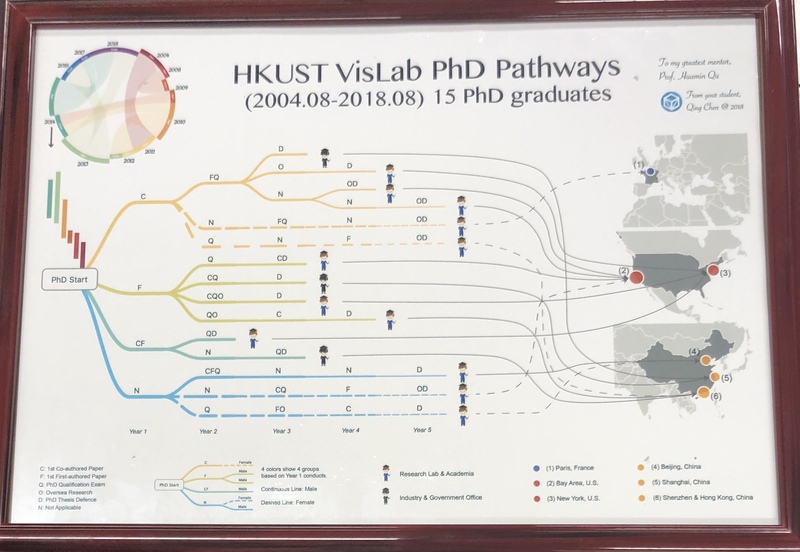 An infographics by my student LI Quan shows the VisLab alumni. 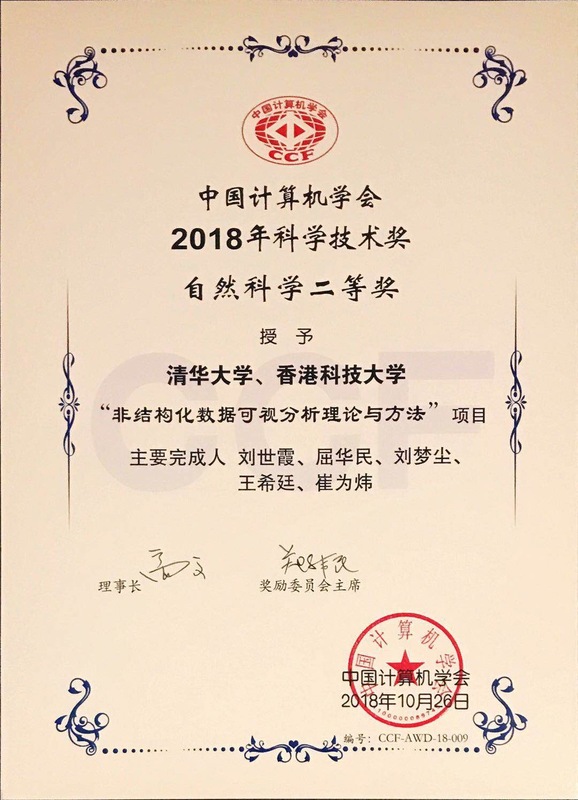 I am voted as one of "Teachers I Like" by Outstanding Students (i.e., CGA>= 3.85) in multiple years (e.g., 2015-2016, 2016-2017, 2017-2018). 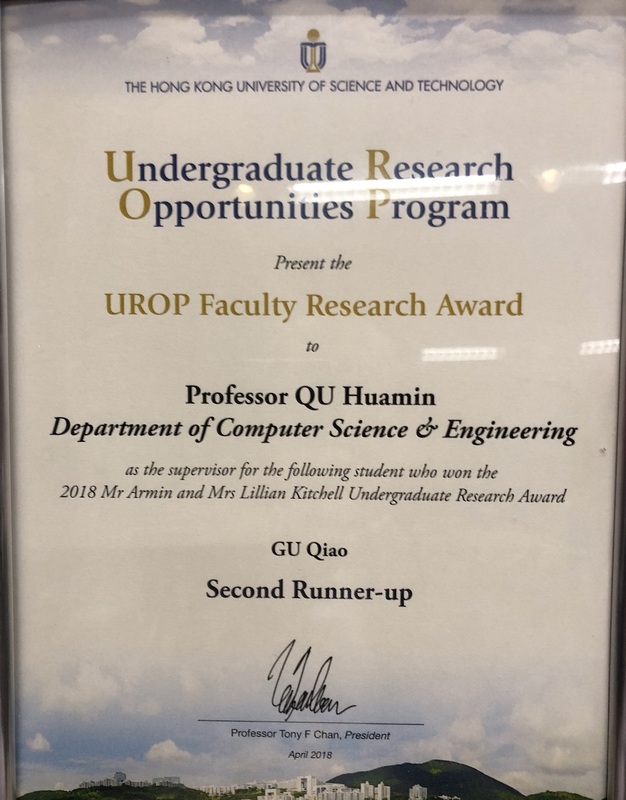 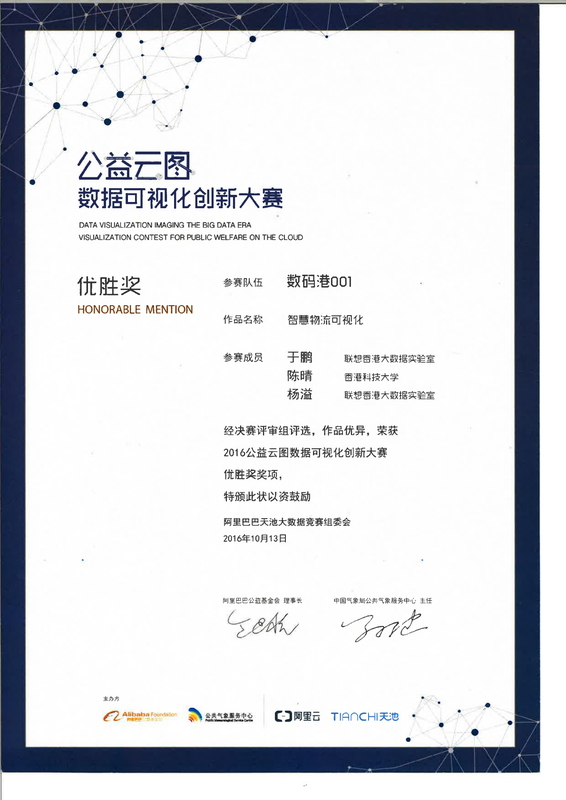 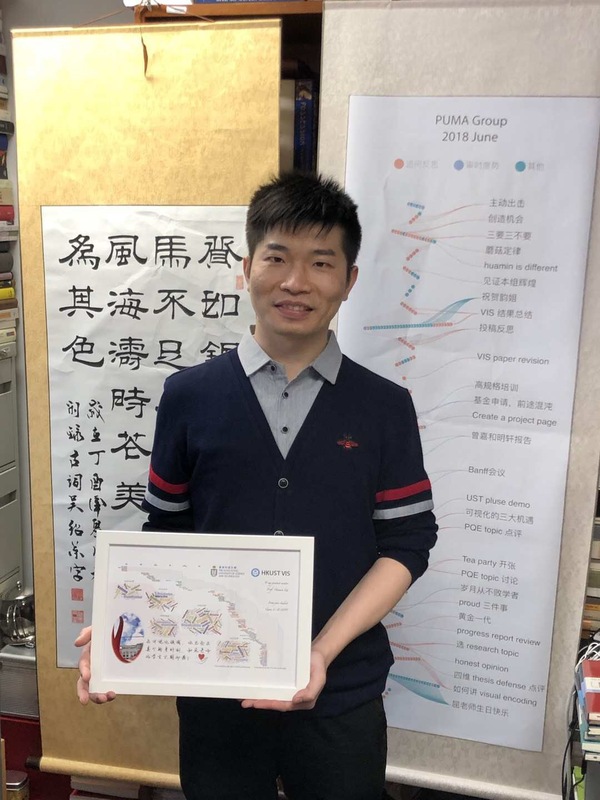 My students Qing Chen and Yi Yang received the Honorable Mention Award in Visualization Contest for Public Welfare on the Cloud organized by Alibaba. 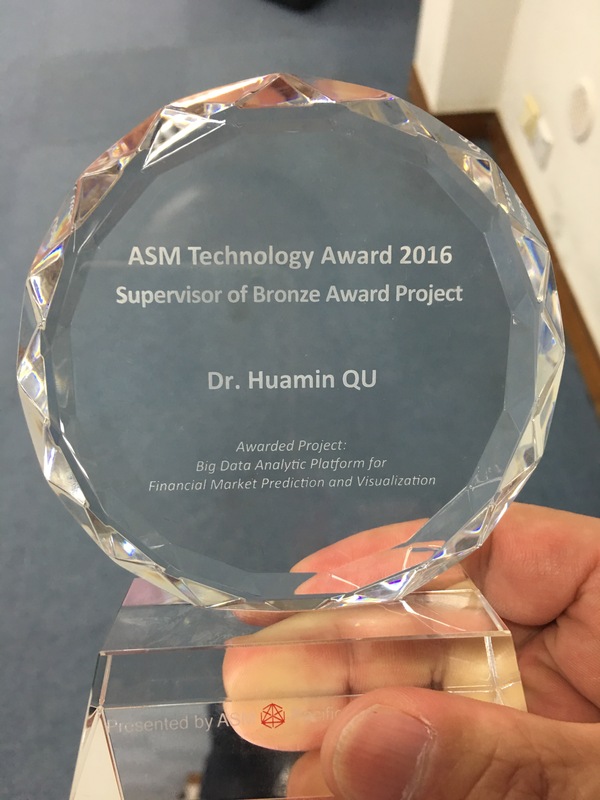 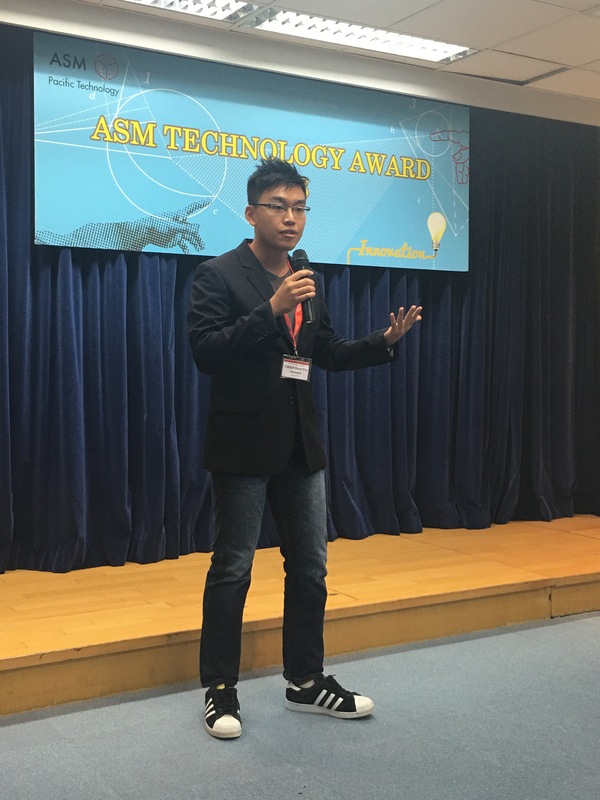 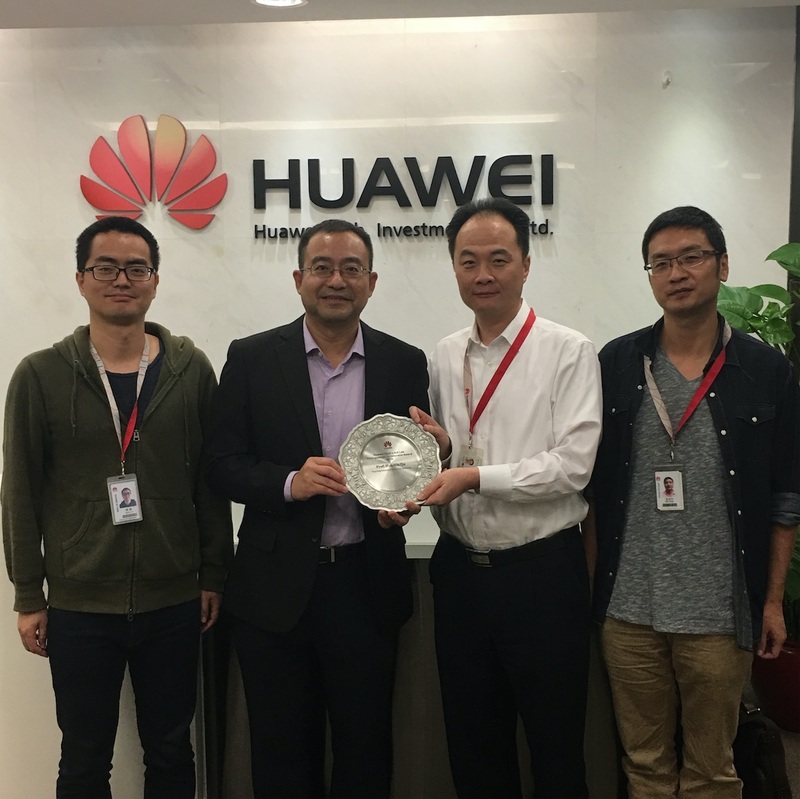 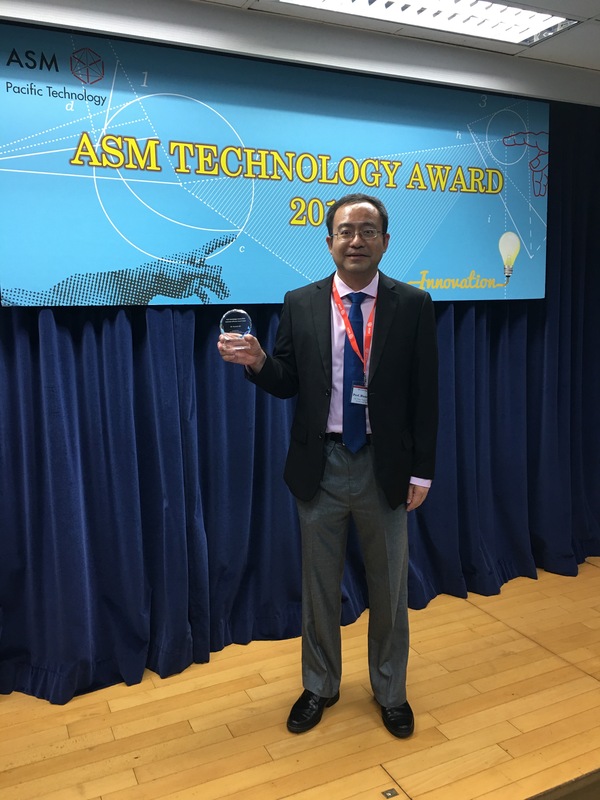 We won Bronze Award of ASM Technology Award 2016 with UG students CHAN Yeuk Yin, CHOW Ho Yin, NG Andy for project "Big Data Analytic Platform for Financial Market Prediction and Visualization". 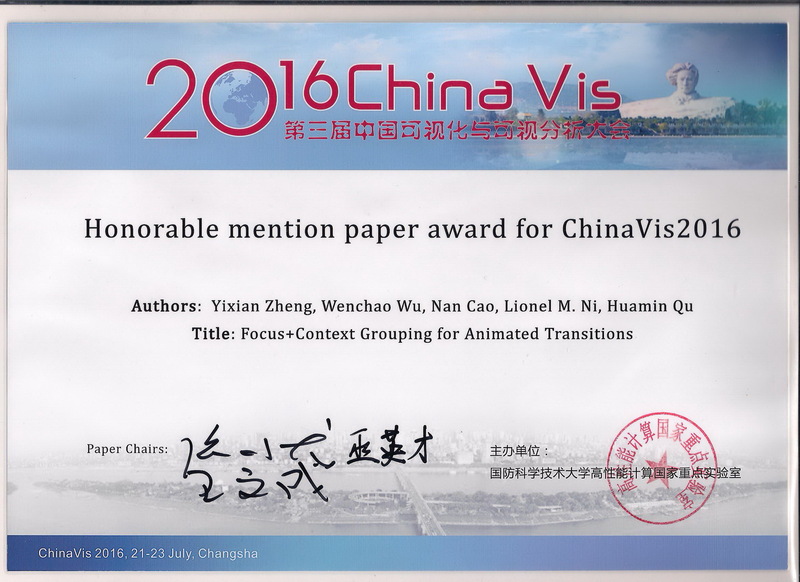 We won an honorable mention paper award at ChinaVis 2016. 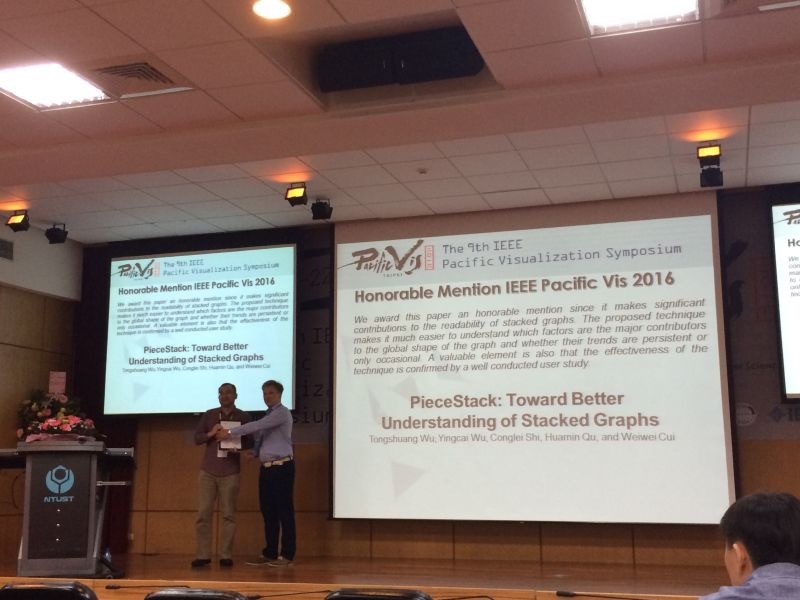 We won two awards at the IEEE Pacific Visualization Symposium 2016 . 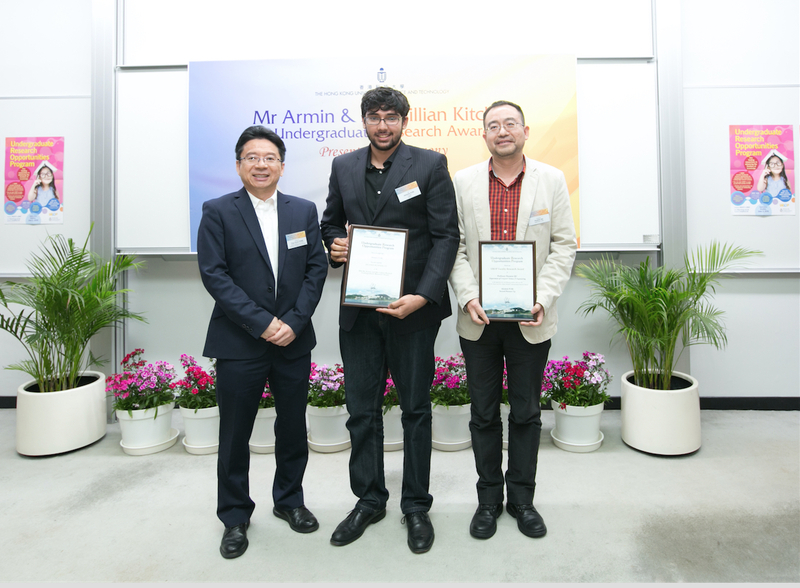 My students Yeuk Yin Chan and Abishek Puri won two awards at 2016 Mr. Armin and Mrs. Lillian Kitchell Undergraduate Research Award. 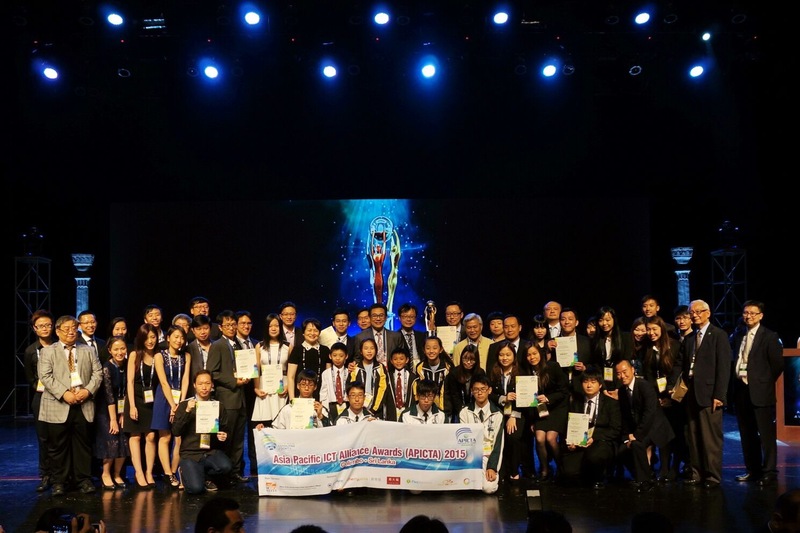 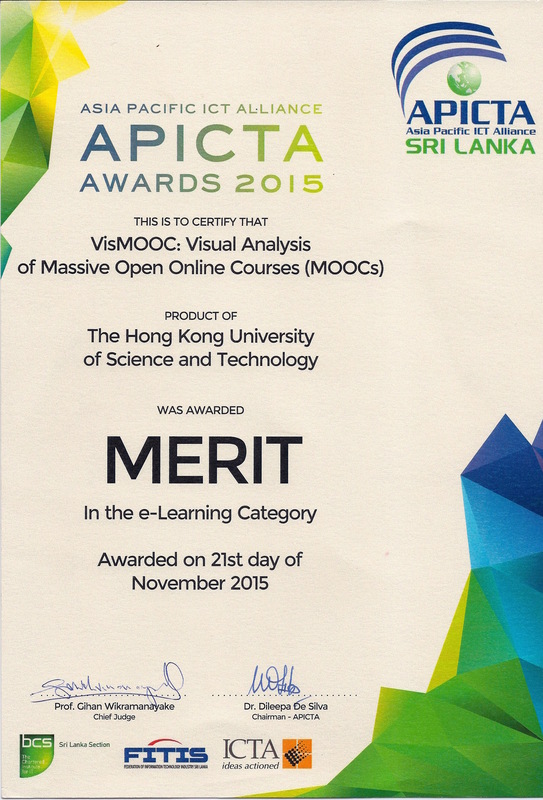 Our VisMOOC won another award: Merit in E-Learning at APICTA'15. 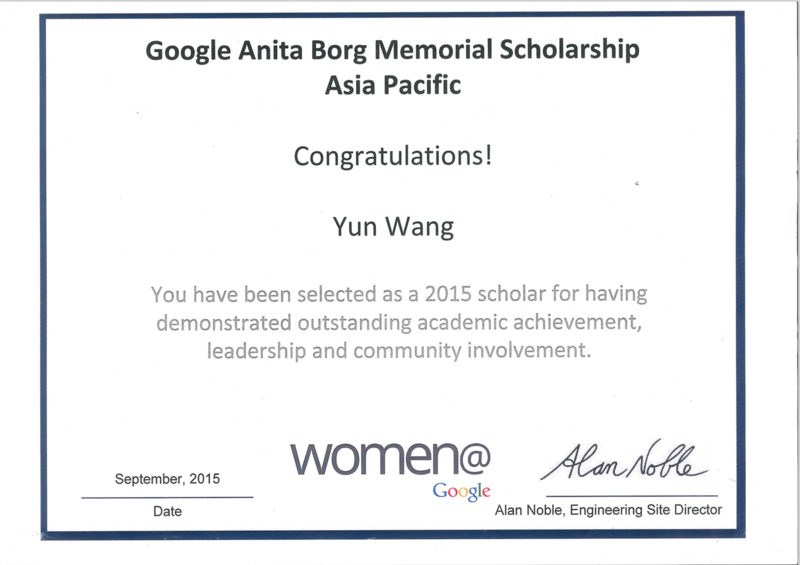 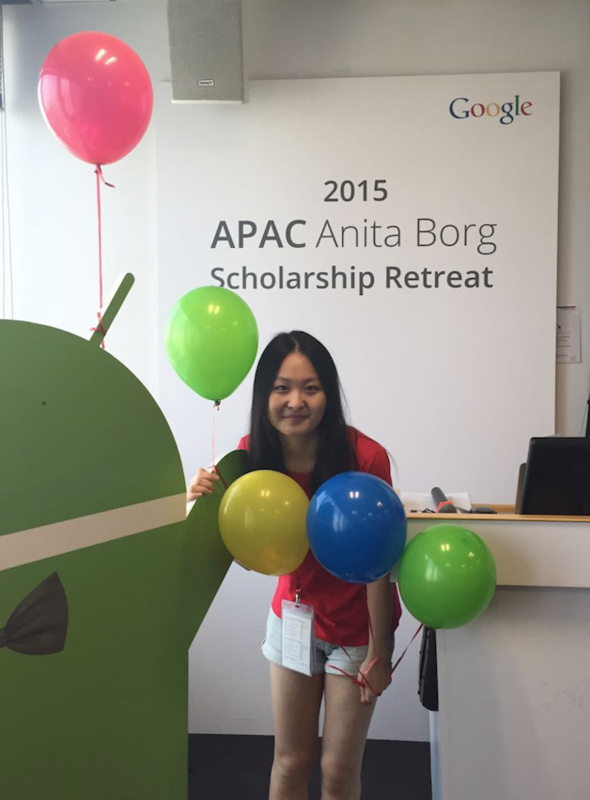 My student WANG Yun won the Google Anita Borg Memorial Scholarship Asia Pacific. 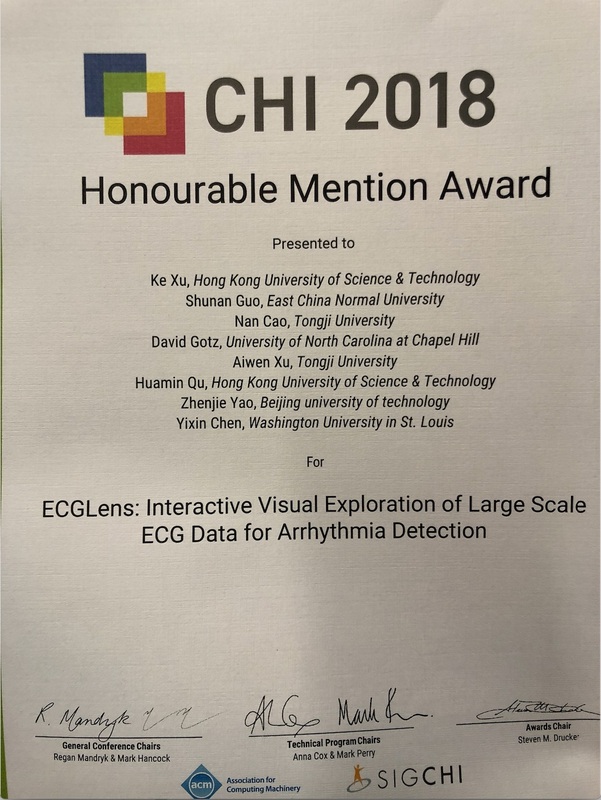 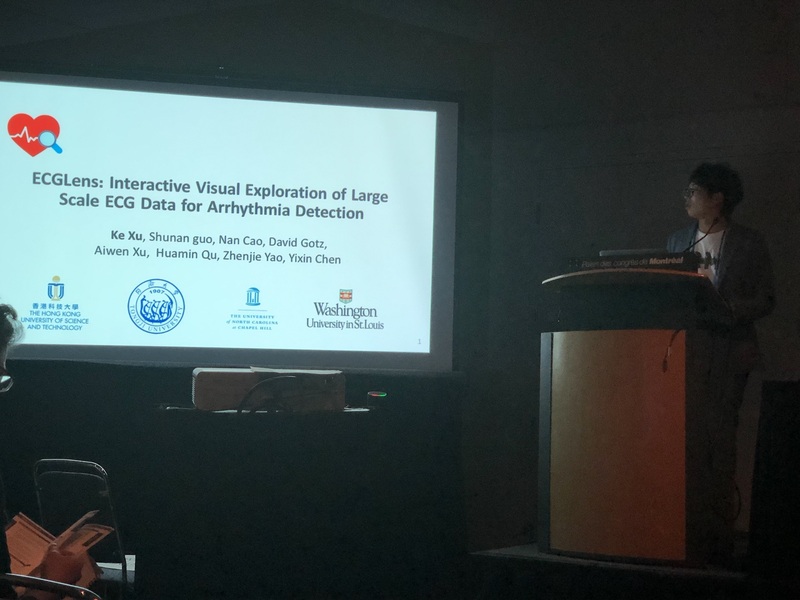 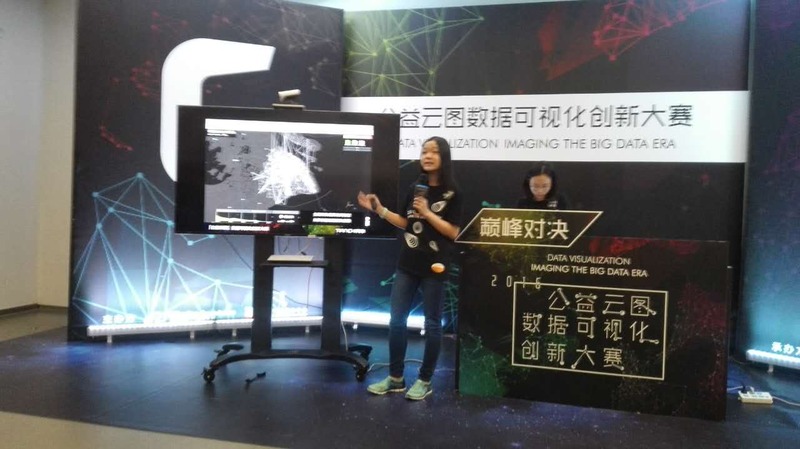 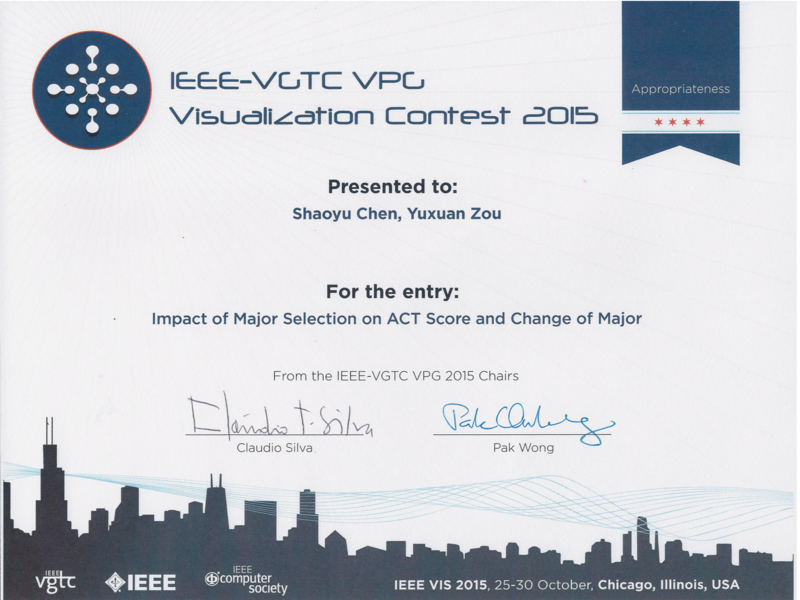 Two UG students (CHEN Shaoyu and ZOU Yuxuan) under my supervision won an Award in The IEEE VGTC VPG International Data-Visualization Contest 2015. 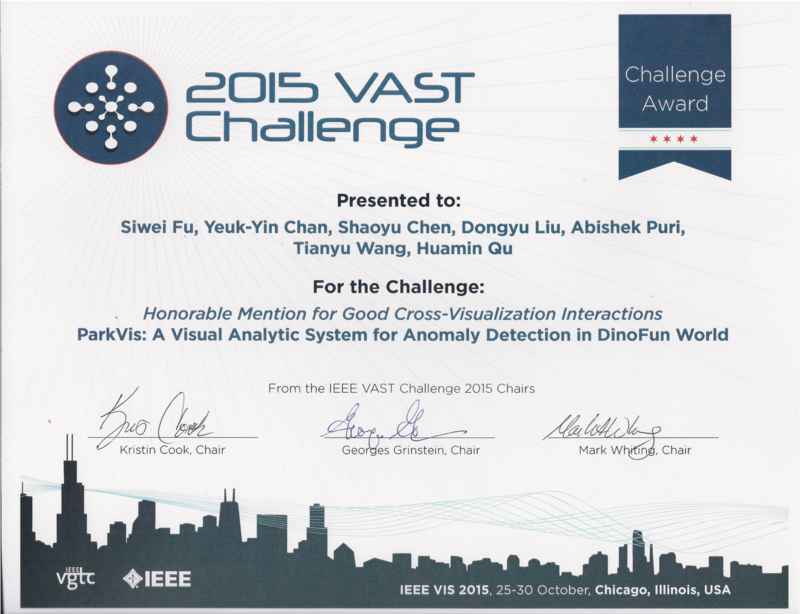 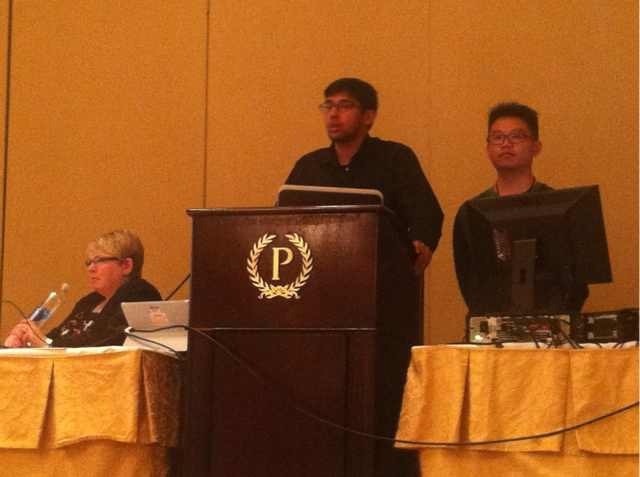 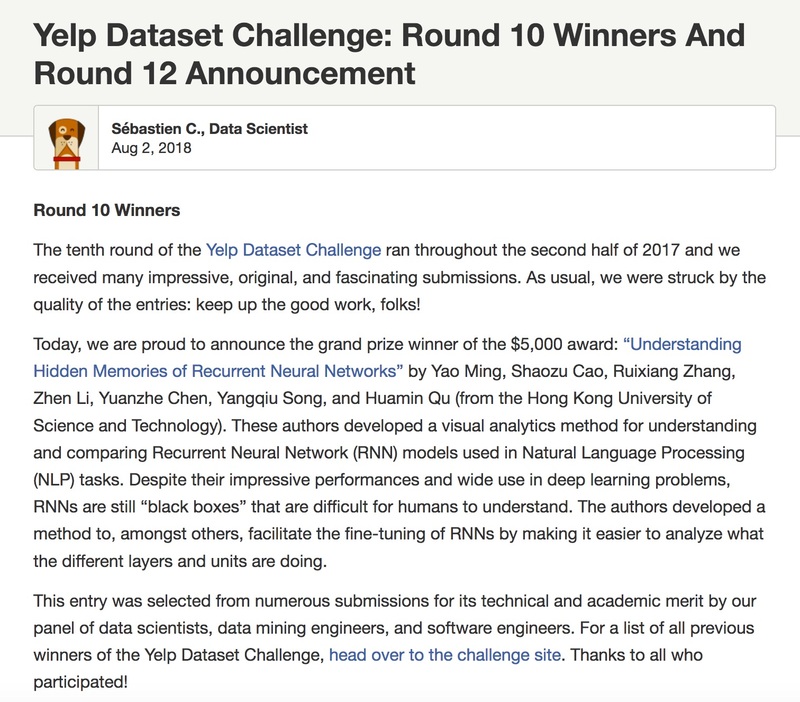 About IEEE VGTC VPG International Data-Visualization Contest. 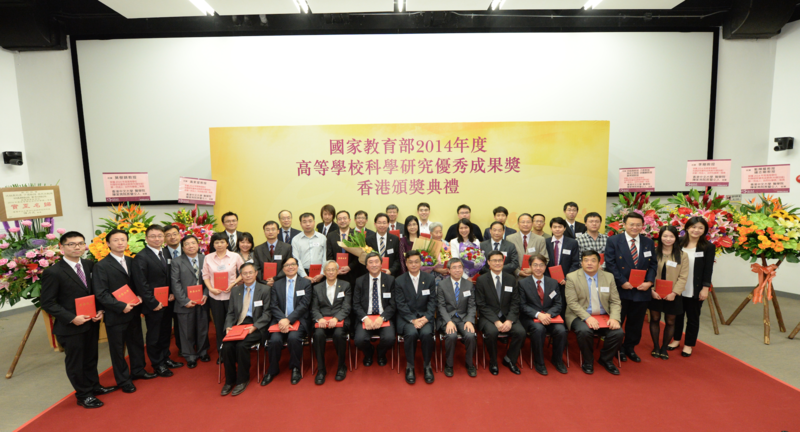 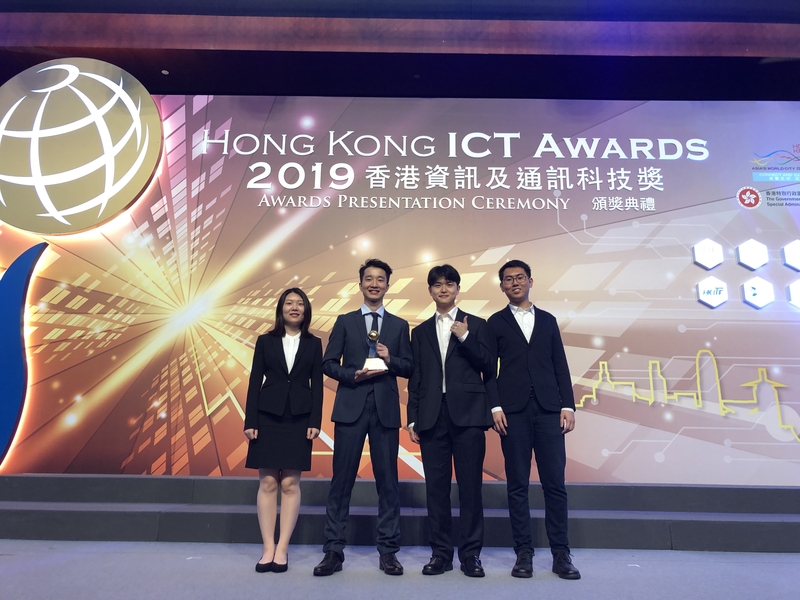 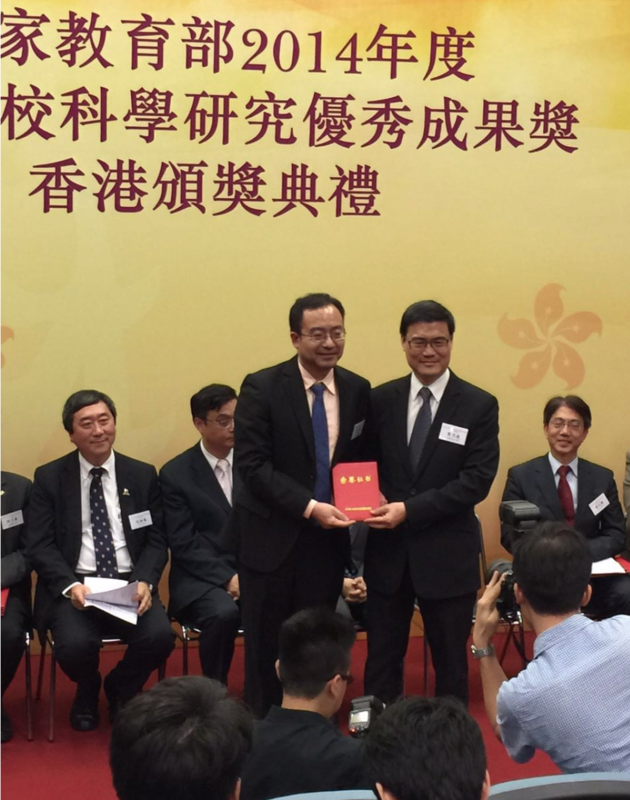 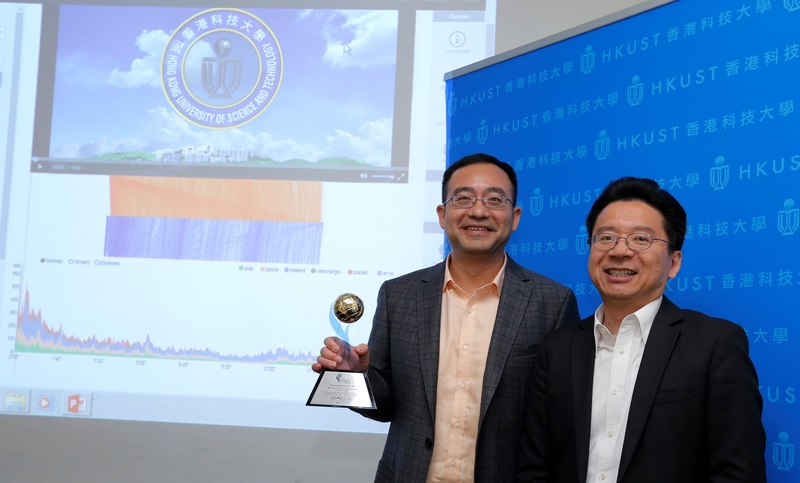 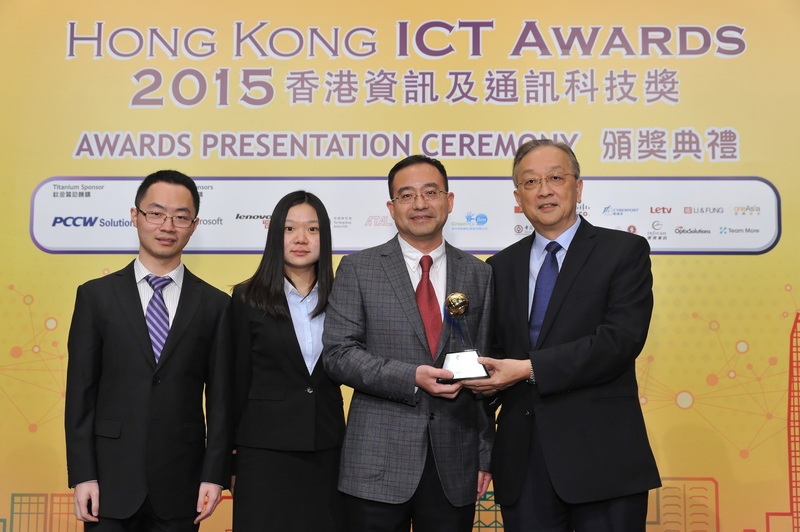 We won the HKICT Best Innovation (Innovative Technology) Silver Award with our VisMOOC system. 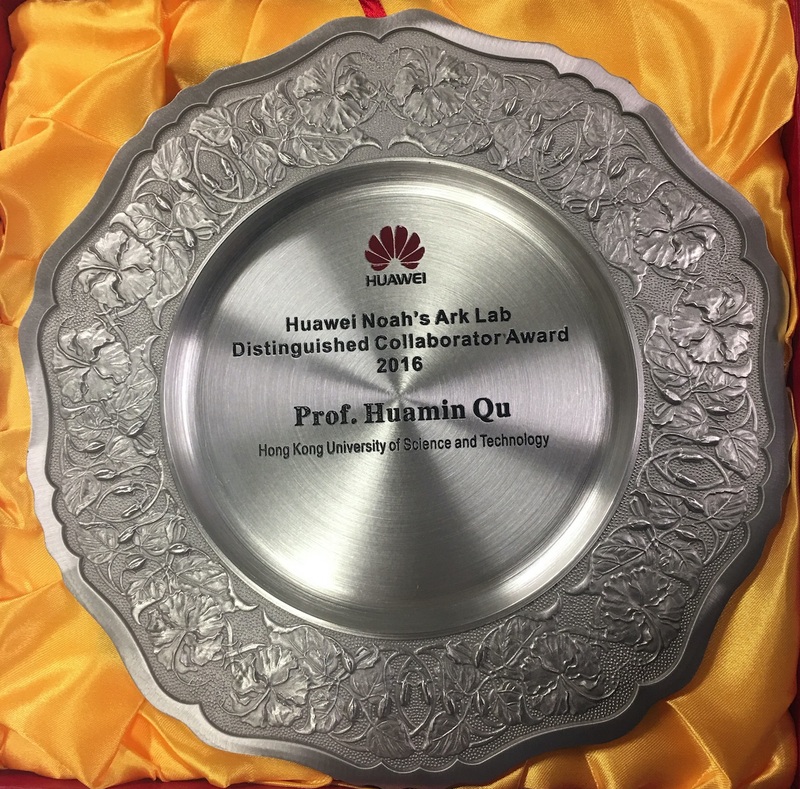 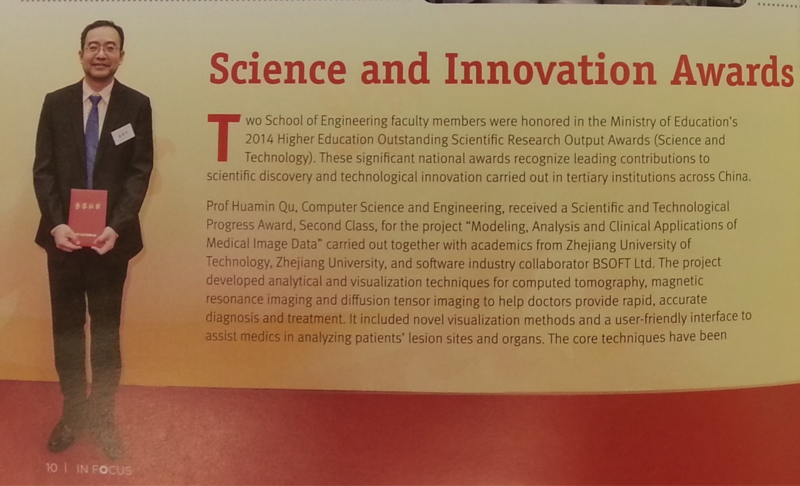 We won the 2014 Higher Education Scientific and Technological Progress Award (Second Class) presented by the Ministry of Education of China. 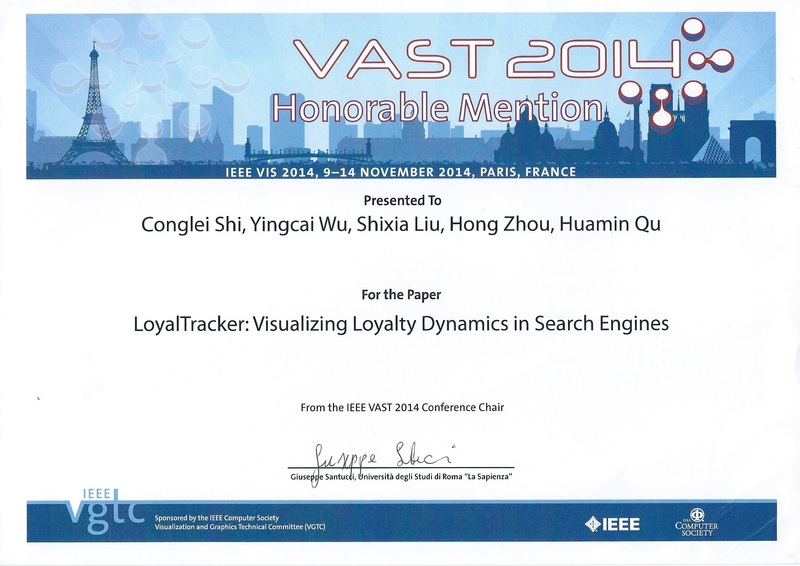 We won the Honorable Mention for Best Paper Award at the IEEE VAST 2014 with paper "LoyalTracker: Visualizing Loyalty Dynamics in Search Engines" by Conglei Shi, Yingcai Wu, Shixia Liu, Hong Zhou, and Huamin Qu. 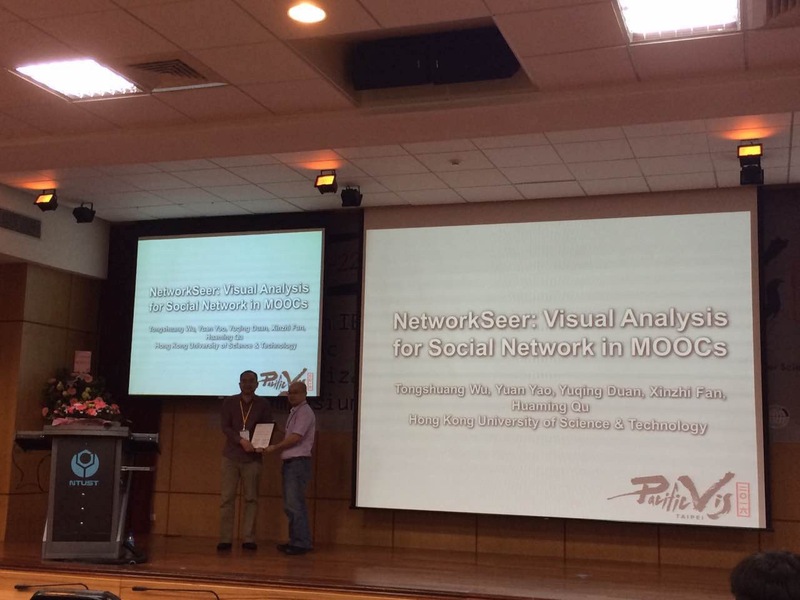 Another Honorable Mention Award is won by our previous group member Nan Cao. 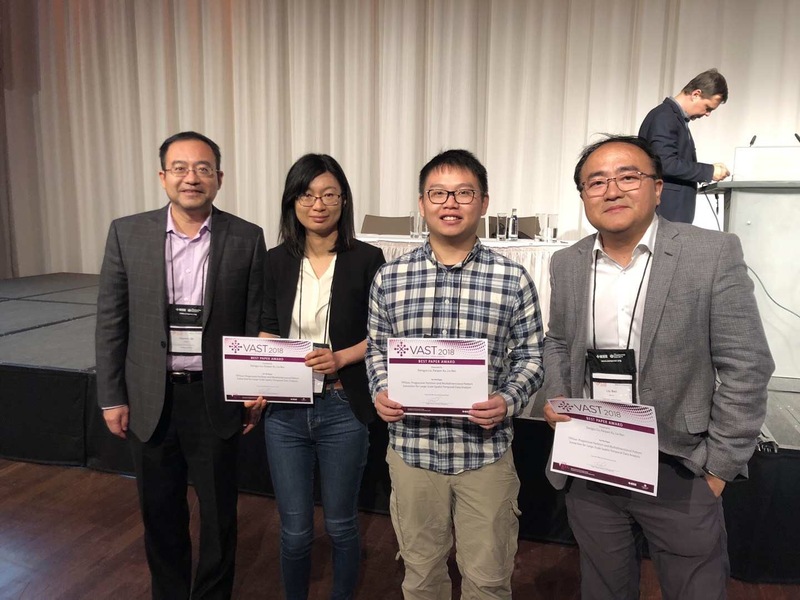 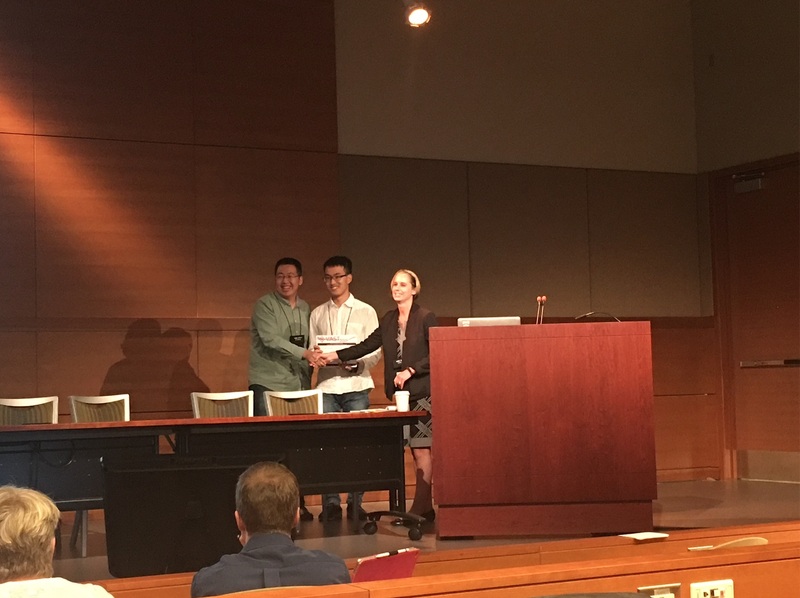 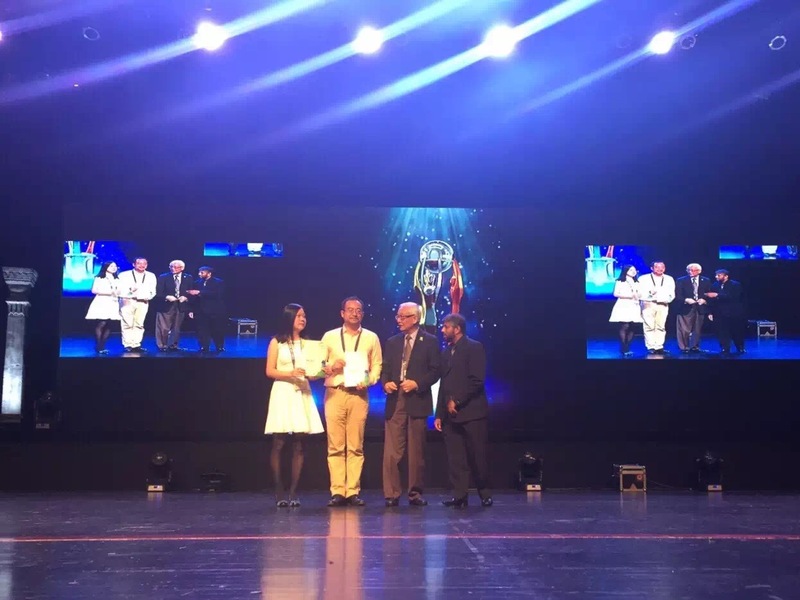 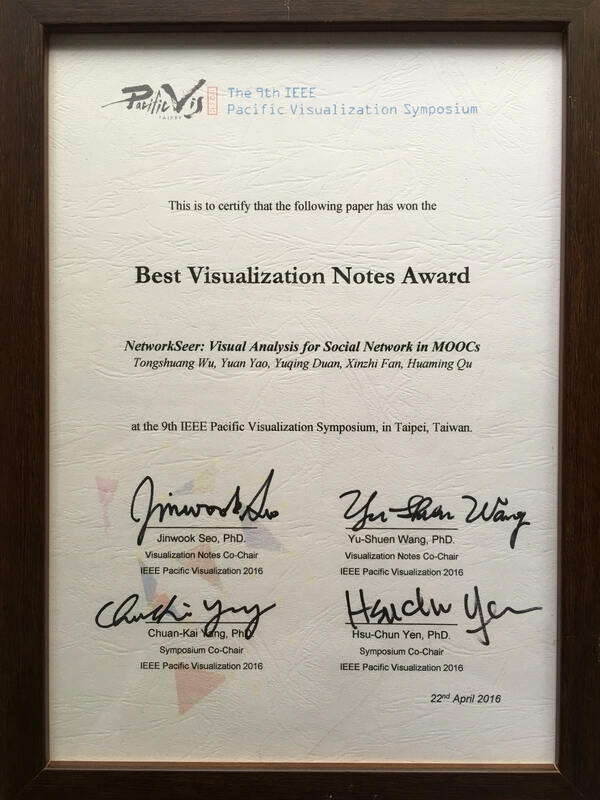 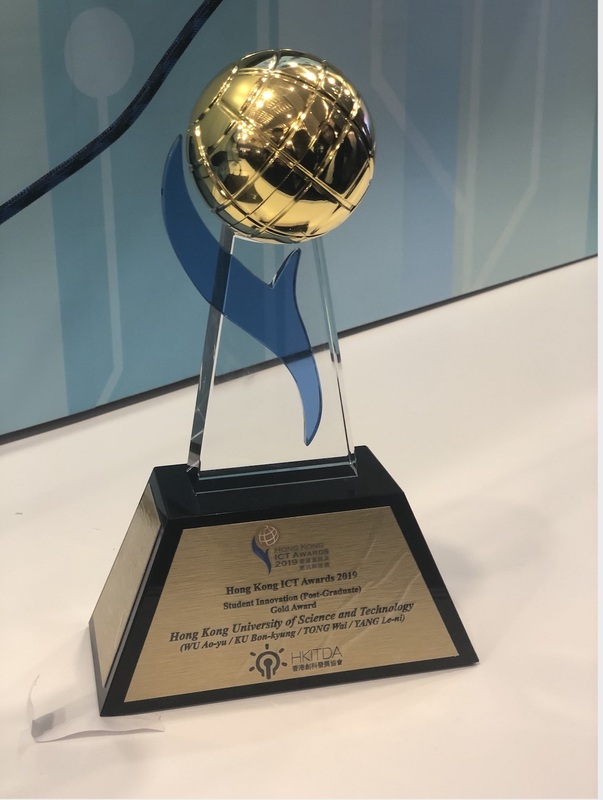 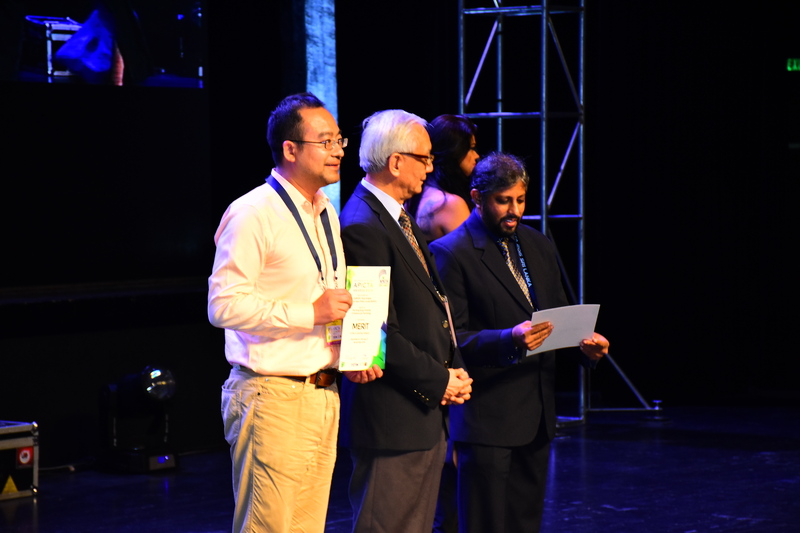 We won the Best Paper Award at the 7th International Symposium on Visual Information Communication and Interaction (VINCI 2014) with paper "Parallel Coordinates with Data Labels" by Hong Zhou, Panpan Xu, Zhong Ming and Huamin Qu. 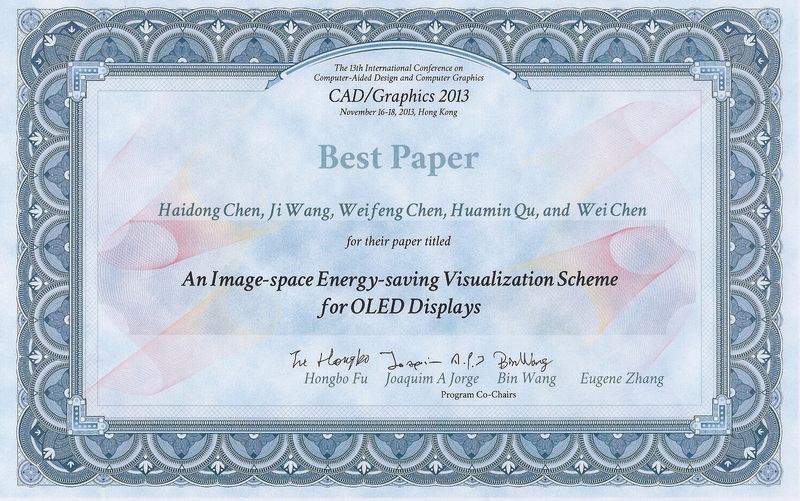 Our paper won the best paper award at the CAD/CG 2013. 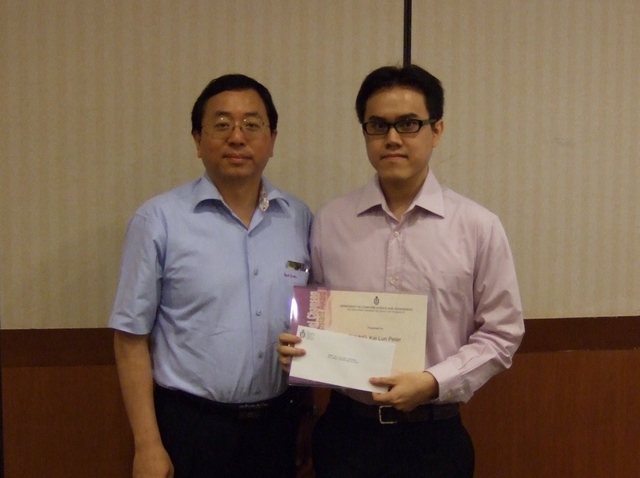 My student Nan Cao won SENG Research Excellence Award 2012/2013 (one of three from the engineering school). 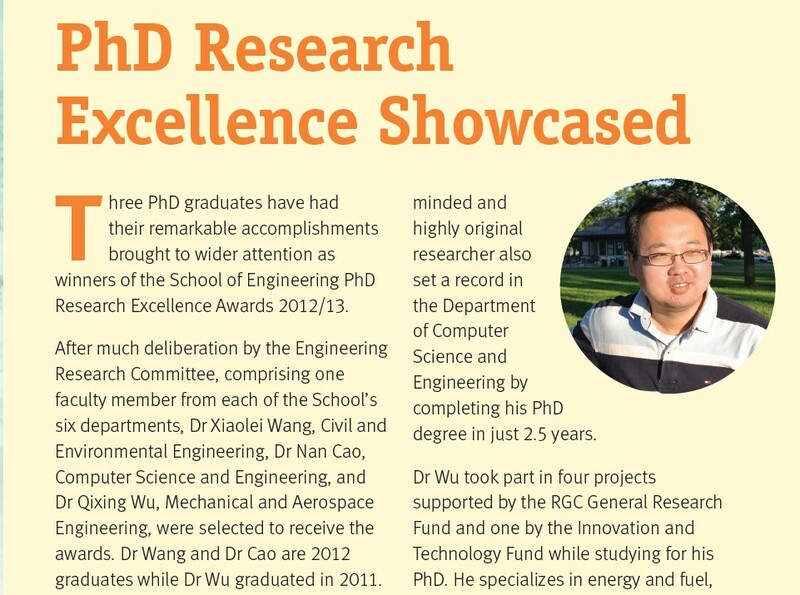 My student Conglei Shi won Overseas Research Award 2012/2013 and SENG PhD Fellowship (1 of 4 from CSE). 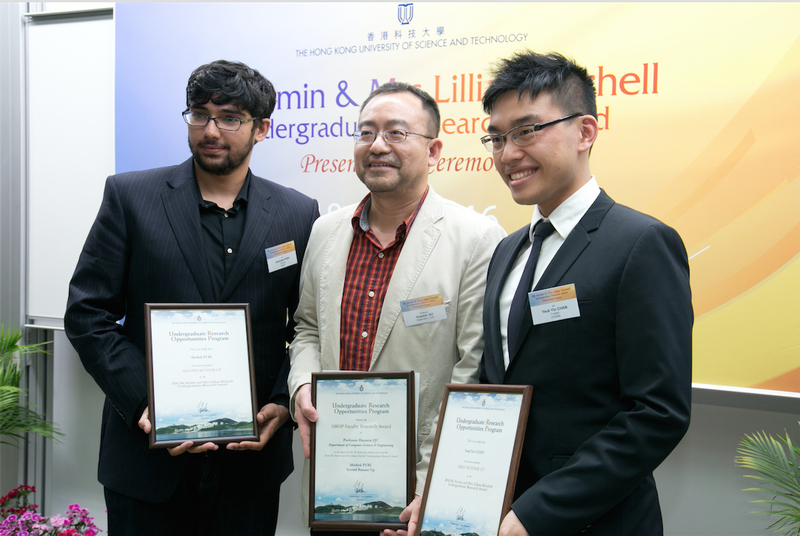 My student Weiwei Cui won IBM PhD Fellowship 2010/2011 (1 of 2 from Hong Kong). 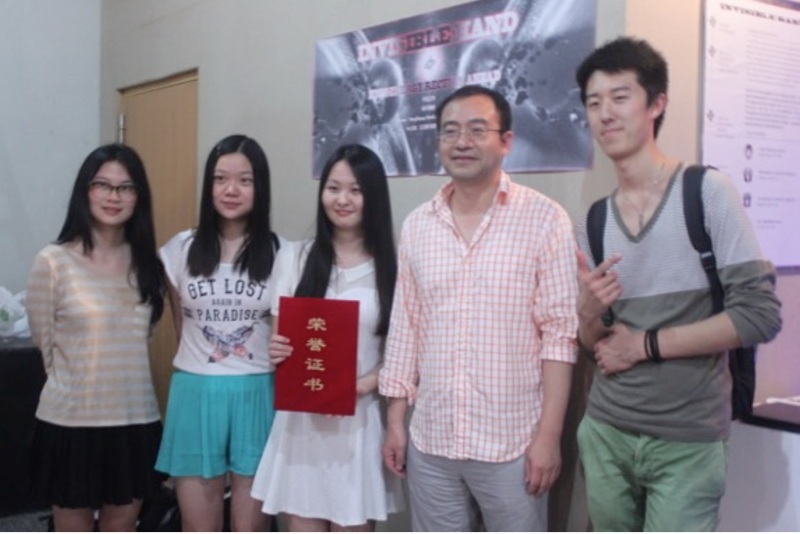 The photo is taken outside the department office. 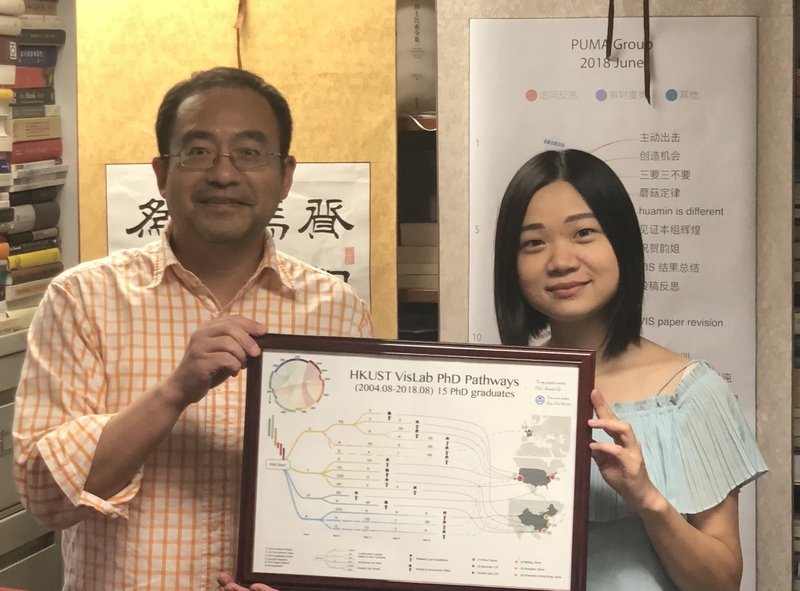 The background figure is from our paper "Knowledge Discovery by Network Visualization". 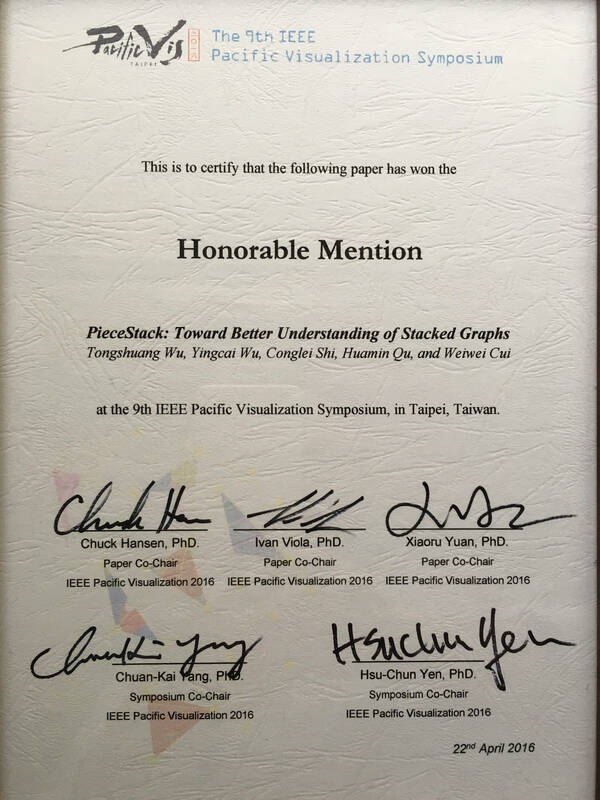 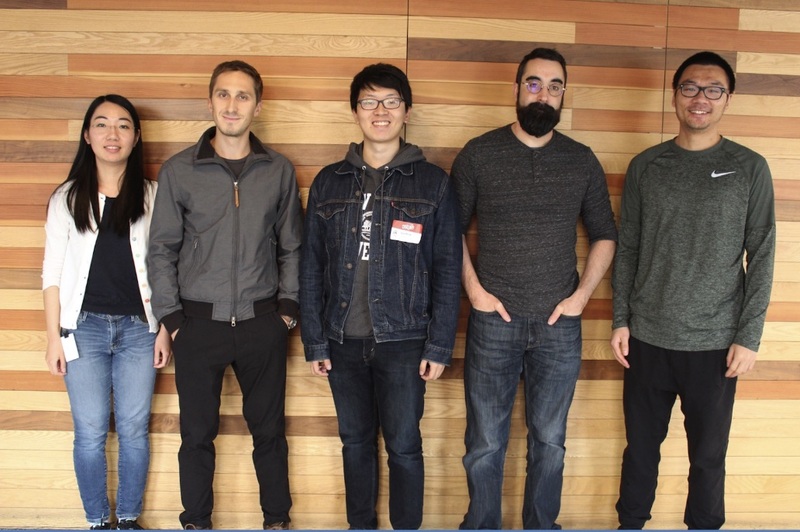 Our paper "Perception-Based Transparency Optimization for Direct Volume Rendering" receives Honorable Mention for Best Paper Award at IEEE Visualization 2009. 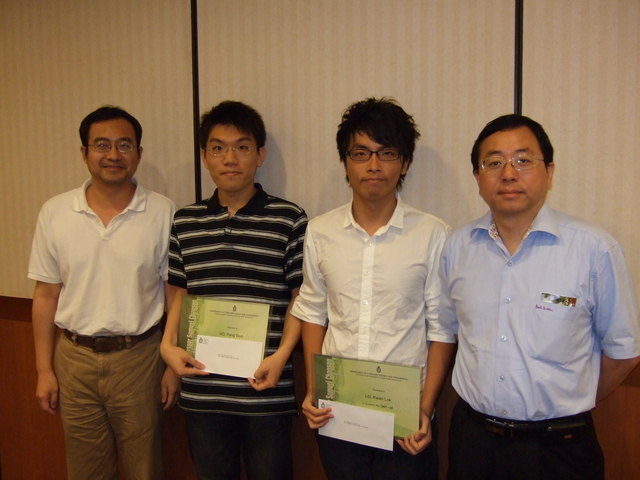 I receives an IBM Faculty Award 2009. 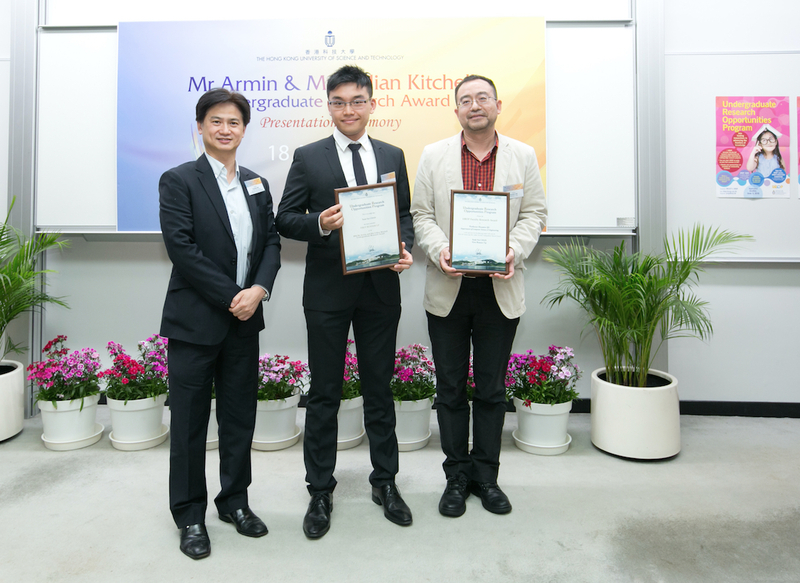 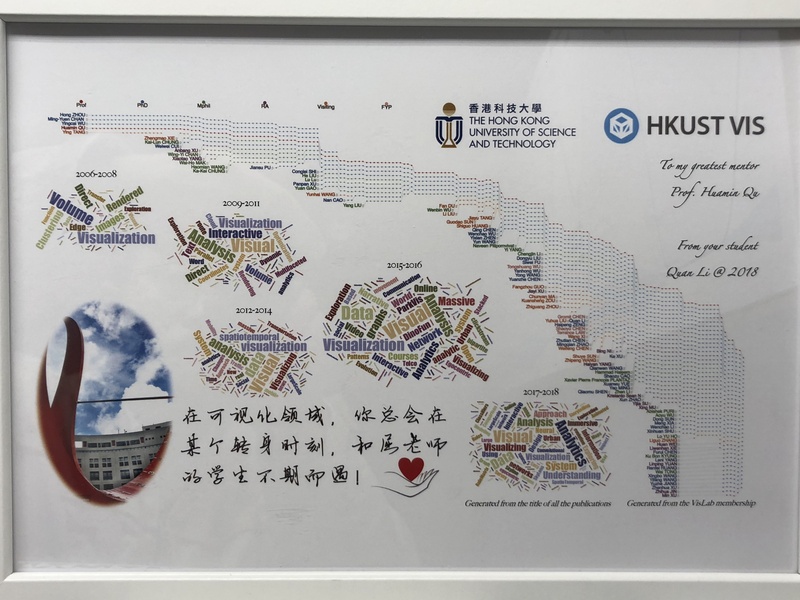 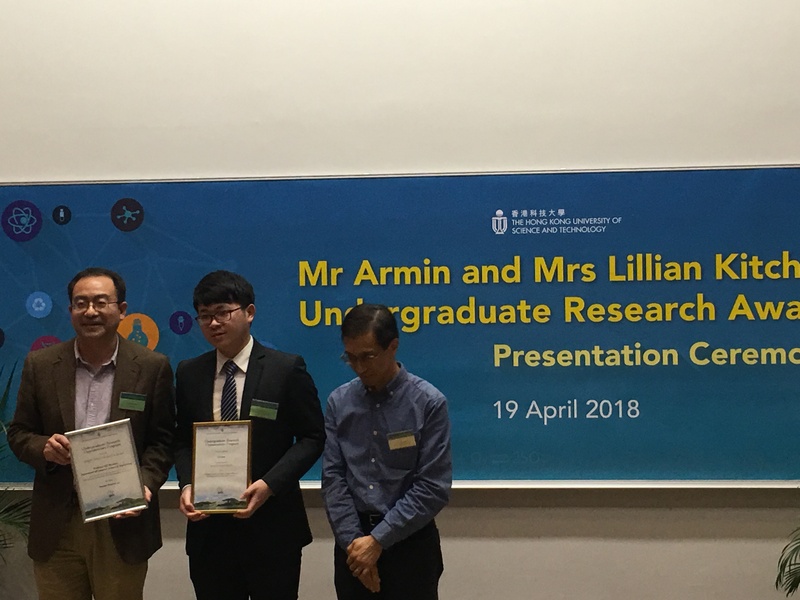 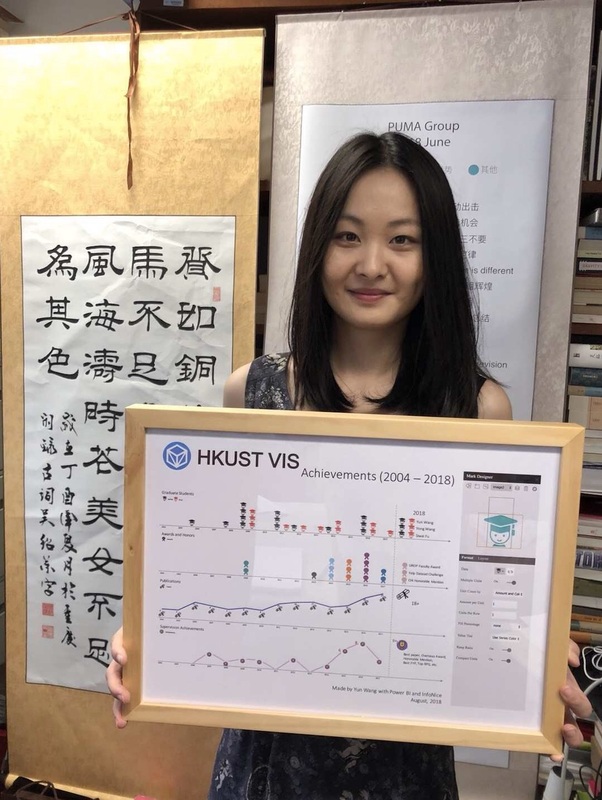 My Mphil student Wing-Yi Chan receives HKICT Best Innovation and Research (College and Undergraduates) Silver Award by visualizing air quality data, which is based on our paper "Visual Analysis of The Air Pollution Problem in Hong Kong"
My Mphil student Peter Chung won Professor Samuel Chanson Best Teaching Assistant Award. 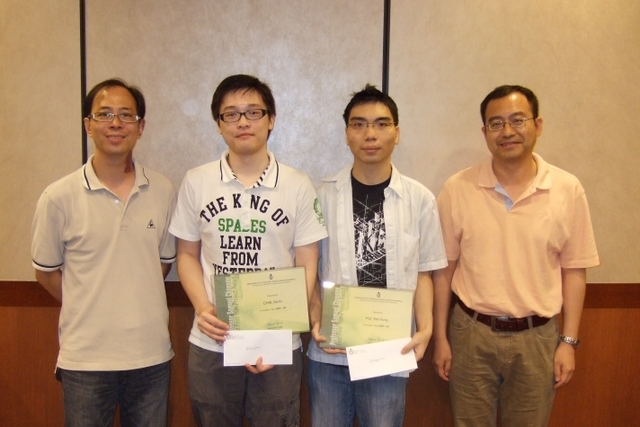 A UG team under my supervision won Professor Samuel Chanson Best Final Year Project Award at 2009. 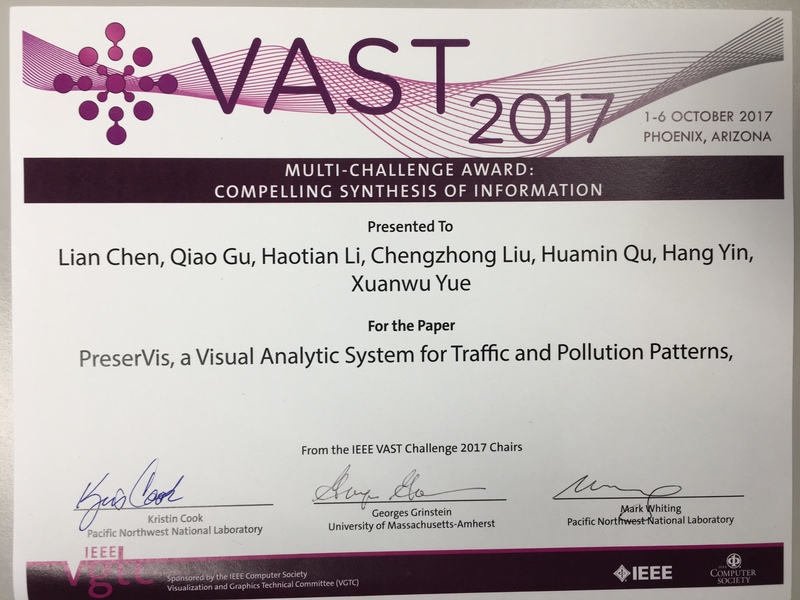 A UG team under my supervision won Professor Samuel Chanson Best Final Year Project Award at 2008. 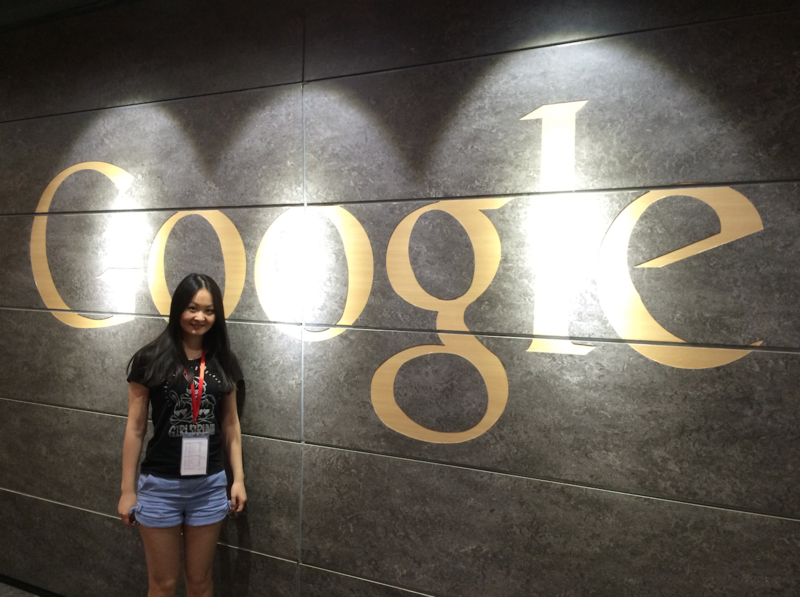 @2004 Huamin's Personal Website .All rights reserved .